This is my own version of a PC board layout for the classic PIC 16C84/16F84 programmer. The design is by David Tait. I've redrawn the schematic and done a board layout. All the files you will need are linked below, including software you'll need to operate it. The software is not by me, I'm just including it for your convenience, and you should follow any usage requests the authors have made. The PC board design is fairly straightforward and can be made by laser printing to special paper or a page from TIME magazine, then ironing the image onto copper-clad board, then etching with ferric chloride. There are a few jumper wires. The power source needs to be at least 15 volts. A 12 volt DC adapter usually produces about 17 volts, so that's a good choice. Two 9-volt batteries in series will work too. Solder directly to the PC board or use a connector that mates with your power source. 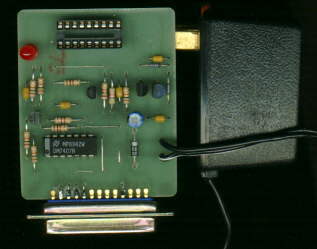 Pay attention to the direction of the voltage regulators because the plastic regulators are backward from the tab type. Substitute Japanese or European generic equivalents for the transistors and diodes, but remember that the pinouts will be different. A right angle PC mount DB-25M connector is specified, but a conventional solder-cup DB-25M connector works, see the picture how I did it. The programmer connects to the parallel printer port of your computer and requires external power. If you want to program a PIC you'll have a hex file created by your assembler or created by someone else(see my propeller clock). You will also need to drive the programmer with some software. Here are programs that run under DOS and Windows. Linux software for Intel-based computers is available elsewhere. Macintoshes do not have parallel ports and can't use this programmer. Do not insert the PIC to be programmed until you have power applied and have run the software, and the programming LED is not lit. The DOS software requires command line switches for fuse settings(unless in the chip's hex file)and also the environmental variable "set ppsetup=3" to be typed before running the program. The Windows software requires the driver "dtait.drv" to be in the \windows\system directory and also the line "PINAPI=DTAIT.DRV" added to the system.ini file. Tell the software you have 7407 chip and PNP transistors. These details are explained in the text files included with the software. DOS software by David Tait "pic84v05.zip". Windows software v1.03 by Silicon Studio "picser.zip". No restrictions on the use of f84pgm. Use of pic84v05 and picser subject to terms set forth by their authors. This page (c)1999 Bob Blick. How to send me email.